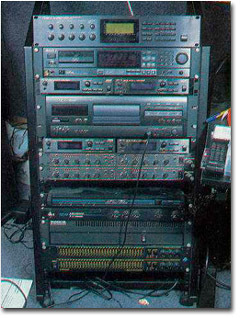 Sony DTC 1000 ES DAT can be spotted on 2nd on top of Liam's old rack setup from 1996. "To play the whole set live would be impossible for us because we'd need about four operators and all the equipment, which I don't want to get into. We have a backing DAT live which has the body of the track with different bits left out so I can play live over the top. All the samples are played live, but not the main riffs in case something messes up!"